In his 2001 Honda Civic, Alex Tyrell is traversing the province of Quebec courting voters for the upcoming election. He’s a candidate, but not for one of the four major political parties. Beyond the Liberals, PQ, CAQ, and Quebec Solidaire, there are 14 other parties running this election. Tyrell is the leader of one of them, the Green Party. “We’re sleeping in youth hostels,” he said. The Green Party has nearly a hundred candidates, more than twice the amount they ran in 2014. Tyrell feels that his biggest obstacle is convincing voters that his party has more to offer than just solutions to global warming. "Making sure that everyone has access to quality public healthcare, that everyone can study, regardless of their means to pay," he said, when asked about other issues his party is focused on. The Quebec NDP party is running candidates, the first time they've done so since the early '90s. Leader Raphael Fortin, who's running in Verdun, is realistic about his party's chances. "It's more of a mid- to long- term project for us to be a force of Quebec," he said. 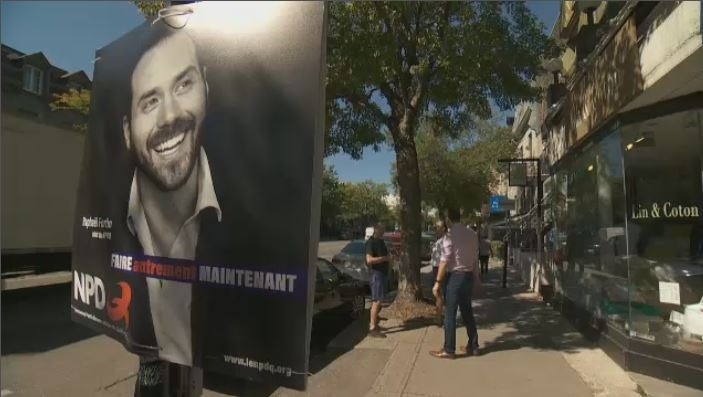 The Conservative Party of Quebec is focusing its efforts on the Quebec City region and Montreal's West Island, where it feels people share similar values. "We're proposing to shrink the size of government and to reduce the tax burden of Quebecers," said leader Adrien Pouliot.